The School of Labour Studies conducts cutting-edge research on domestic and international labour issues. We are leaders in community-engaged scholarship, collaborating with unions, community organizations and policy-makers. Our research helps make work better for everyone. The world of labour is constantly changing. That's why the School of Labour Studies has partnered with both the Hamilton District Labour Council and Unifor to offer two unique labour studies certificates designed to provide the most current labour education. An interdisciplinary program where work is studied as one component of a larger life experience that includes family life, community relations, gender relations, and state policy. Canada's leading program studying contemporary work, workers and social justice movements. We offer both an exceptional master's program as well as North America's on PhD in Labour Studies. Our BA program is innovative and interdisciplinary in nature. 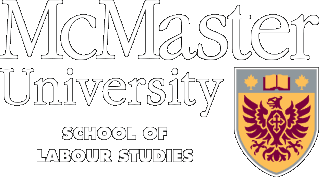 The McMaster School of Labour Studies is widely recognized as among the best in the world. In their classes our students engage with the many and varied issues that animate our contemporary worlds of work. Our Honours BA graduates have high rates of success in securing careers in labour law, community development, Industrial relations, health & safety, lawyer, mediator, disability case worker, civil servant, community development, policy analysis, teaching, occupational health and safety, labour research and labour organizing. Honours students are required to complete either an honours thesis or a field experience. Field experience allows them to sharpen their research skills while gaining practical experience working for a union, government agency or private employer. Students graduate with a double major in Labour Studies and another subject. Work is central to our health (physical and mental), our economic well-being, our society and our economy. In short work affects everyone. The minor in Labour Studies is a strong complement to almost any undergraduate degree program. It provides an interdisciplinary and well rounded view of our contemporary worlds of work. The prime objective of this unique graduate program is to introduce students to a variety of theoretical approaches and practical policy debates that relate to working in contemporary societies around the world, as well as Canada. Courses focus on a broad range of work activities, from working for wages in primary, industrial and service settings, to the paid and unpaid work that goes on in the home and elsewhere. Regardless of the particular focus, work is to be studied as one component of life experience that includes family life, community relations, the effects of racism, sexism, homophobia, and ableism, politics and state regulation. The only such degree in North America, the PhD program engages closely and critically with the issues of work and labour in contemporary and historical perspective. The program aims to develop a new generation of scholars prepared to contribute to research leadership in the academy, the community, policy arenas and organizations representing working people. As a small interdisciplinary program, students will enjoy strong mentorship from leading scholars in the field and benefit from the strong union and community connections of faculty. The McMaster School of Labour Studies offered its first certificate courses in 1976. We currently offer a Certificate in Labour Studies as well as two joint certificates in partnership with the Brantford and Hamilton and District Labour Councils.